Unprotected walls and corners are often overlooked in retail establishments, but this exposure can lead to damage from shopping carts and other equipment. Investing in wall guards and corner guards from McCue can save you money while keeping your business looking fresh. Contact us to get a quote! You need to protect your store with solutions that get the job done but don't detract from your its aesthetics. McCue bumpers and guards are designed to keep your walls and fixtures from incurring costly and unsightly damage while enhancing their appearance. They sit flush against walls, cases, cash registers and more to prevent everyday wear and tear. Stainless Steel Bumper – The Stainless Steel Bumper looks sleek and modern against any wall or fixture. 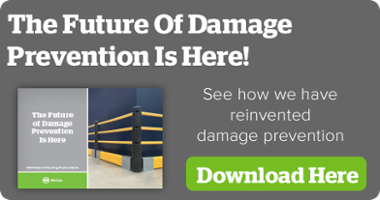 This wall guard can be installed in just minutes and requires no maintenance. It can be custom cut or cut to fit on site. CartGuard Flex – The CartGuard Flex is an impact-resistant, flexible bumper that is designed to protect curved fixtures from damage. It can be used on a radius as small as 4" and comes in two sizes: 1" (Cart Guard Flex 1) and 2" (Cart Guard Flex 2). Green Guard 8 – The Green Guard 8 is a 100% recyclable bumper that provides maximum wall protection. In fact, it outperforms PVC by 29% and ABS by 63%. The Green Guard is our widest bumper option and is also scratch resistant. Corner guards protect vulnerable corners in your store from damage. And they're designed to install quickly and easily. UniGuard 75 Corner Guard – The UniGuard 75 shields exposed corners on walls, shelving and more. It can be installed right up against any fixture to minimize tripping hazards, and the sleek, stainless steel design fits in with any decor. Corner Guard Standard – The Corner Guard Standard is designed to fit snug against the corners of walls and fixtures and protect them from impacts. The durable HDPE coating and stainless steel strike plate eliminate the need for frequent upkeep, and our patented flange anchor system provides for easy installation. McCue takes asset protection seriously. That's why we've designed our wall guards and corner guards to withstand the hazards of the retail industry. We're innovators in our space, and we're dedicated to providing our customers with new solutions to help protect their assets and reduce costs. Request a quote for any of our products today.